Airing My Laundry, One Post At A Time...: Natalie Saw Her First Musical: Wicked! 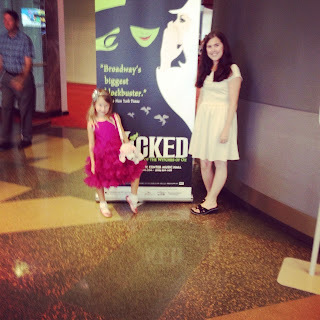 Natalie Saw Her First Musical: Wicked! This was the first thing Natalie yelled yesterday morning. I had told her for months that we were going to get to see the musical. I kept reminding her that we had to be quiet during the show. We could not shout, "WHAT HAPPENED?" if we were concerned about something. We could not yell, "I want her dress!" when Glinda came on stage. Look, I know my daughter. I know she is capable of doing those things. It's a little blurry because electronics confuse my mother. Natalie was worried about the dragon. "It's not going to try and eat us, is it?" "It will if you talk during the show," I answered. The show began and I was immediately sucked into the music and storyline. Yes, I might have seen it before in NYC but it was still amazing. I always marvel when people can sing. Really sing. This is because I can't carry a note. 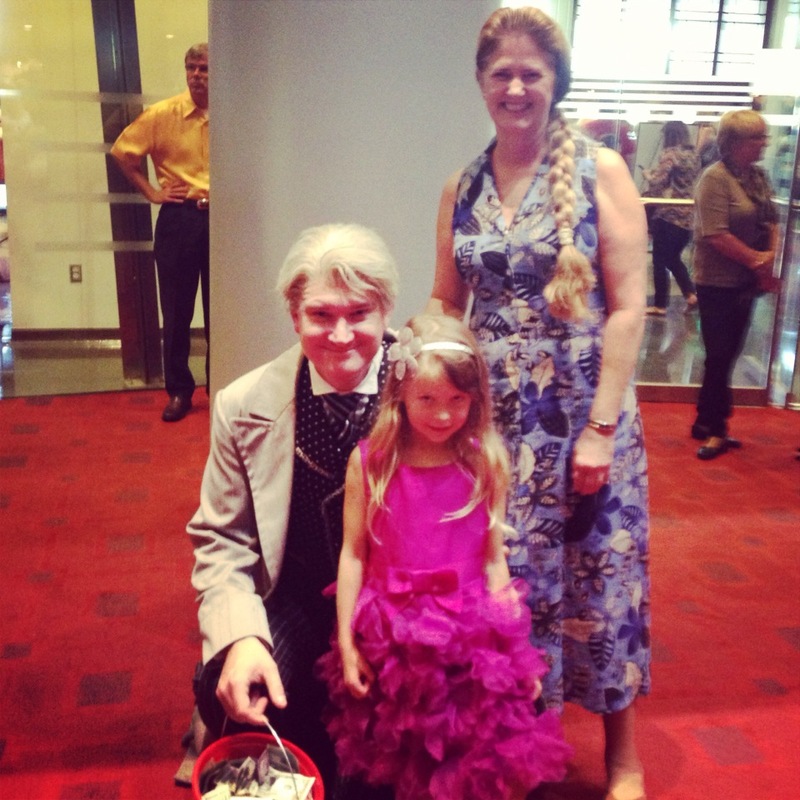 Natalie cracked up during the song Popular and whispered to me that she wanted Glinda's pink dress. Natalie climbed on my lap when the Wizard's face began to talk. The flying monkeys also made her a bit nervous. She loved the Defying Gravity number. She had seen it on YouTube so she knew Elphaba was going to fly. When she did, Natalie went, "She's magic." At intermission when the lights came on Natalie went, "That's all? That wasn't an ending." I explained intermission to her as we went out to stretch our legs. I saw the long line stretching out of the women's bathroom and thought, "Thank goodness I don't have to go. Thank goodness we don't have wa--"
"Mommy? I need to pee," Natalie said. So we had to wait in the long line. Then we went back to our seats and the show began again. It was still amazing. I knew the ending. I knew what to expect. But it still made me tear up. Especially with the For Good song. I once tried to explain it to Tom after I had seen it in NYC. "And...they had to say GOODBYE to each other. They told each other how they helped one another...through SONG. Would you ever tell me how I made you a better person through song?" I asked Tom, gripping his arm. "No. Never," he answered. Rude. Anyway, Natalie was concerned when Elphaba melted. "But I loved her!" Natalie whispered. "I loved her," she said into my ear. I won't give away what happens because I know there are still people out there who don't know. I know this because of all the gasps I heard in the audience. The show was fabulous. I loved the cast--they were just as good as the one in NYC. However, I preferred the atmosphere in NYC because, hello, it's NYC. Also, that theater was more civilized. The Civic Center allowed people to come to the show late. Which irked me because hello, distracting. Also, you could drink and they said not to eat food, but people still ate food so you could hear the paper crinkling from said food. Annoying. But other than that, I still loved Wicked. I think I would love Wicked if children sang it off key. The story is just that good. When the show was over, some actors came out to take donations for the tornado victims. Not Elphaba or Glinda. Natalie wished. She wanted to tell Glinda that she loved her sparkly dress and clown. She wanted to tell Elphaba that it made her sad when she melted. She also wanted to tell her she liked her flying broom. There was a flying monkey walking around and Natalie was excited to meet him at first, but then when we got up close she attached herself to my leg and went, "I'm freaked out!" So we left the flying monkey and found the dude who played the wizard. He had an awesome voice. Talking and singing. Very soothing. "That man who drank the green juice told me he liked my dress," Natalie informed me primly after the picture. If you haven't seen Wicked, you should! You'll love it! If you're around the Oklahoma City area, it'll play until September 22nd so you still have time. And no, I was not paid to say that. I just love Wicked that much. I'd go see it again if I had the money. Now if you'll excuse me, I'm off to listen to the soundtrack and pretend as though I can sing. Glad you had a good weekend! What a great thing to take your daughter to, I'm sure it's something she'll remember forever. Your daughters dress is gorgeous! Sounds like your daughter had a wonderful time. I would love to see Wicked. Am dying to see it! Lisa has seen it a few times already and always tells me how amazing it is! This paragraph made me LAUGH OUT LOUD!! Then we went back to our seats and the show began again. It was still amazing. I knew the ending. I knew what to expect. But it still made me tear up. Especially with the For Good song. I once tried to explain it to Tom after I had seen it in NYC. "And...they had to say GOODBYE to each other. They told each other how they helped one another...through SONG. Would you ever tell me how I made you a better person through song?" I asked Tom, gripping his arm. "No. Never," he answered. Rude. I love that you took her to a musical!!! Kids need to be shown how awesome things like this are, before their friends tell them differently! I'm pretty sure my daughter would be terrified of wicked! too bad, it's coming here soon! Oh, I'd love to take my daughter to a show. Well, we went to a Wiggles show once. Does that count? Didn't think so!! How fun!! She is so cute. ha! You always crack me up. WTH, Tom? Sing to her! I can't carry a note, unless I"m drunk and in the shower. Why would I be drunk and in the shower, though? That sounds dangerous. I can carry a note if I plug my ears. With high-efficiency ear plugs. Glad you had fun! Glad Natalie was captivated and met the wizard! I am dying to see it! It's an amazing show. Will definitely see it again. My husband and even my 18yo son loved it!! It was in my neck of the woods for a little while but, sadly, I wasn't able to make it and I was so bummed! I really want to see it!! Glad Natalie was good and didn't get eaten by the dragon ;D ha ha! I'm so glad Natalie loved it! I'm dying to take my kids to a musical ... only that would mean we would have to take a trip to London or NYC ... and that is going to cost money! Lucky!! 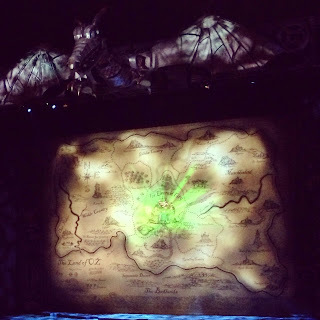 I haven't seen WICKED yet, but it's definitely on my list! I really should see it, while I'm still in NYC! Even if he won't you can still sing to Tom about how he makes you complete. I haven't seen Wicked but I would love to! The musical I saw live (not counting the countless musicals from middle and high school) was Phantom of the Opera at Her Majesty's Theatre in London...I LOVED it!! I recommend that one if you haven't seen it. Of course you can catch it here in the US though, no need to go across the pond for a show....oh and Natalie's dress? ADORABLE!! !